Erdoğan Is Wrong on Syria. Turkey Cannot Get the Job Done. Turkish President Recep Tayyip Erdoğan's plan for Syria is merely about substituting jihadists hostile to him with ones friendly to him. Shortly after President Donald Trump's controversial decision to pull out U.S. troops from Syria, a move that exorbitantly pleased Turkey, Russia and Iran, Turkish President Recep Tayyip Erdoğan, in a charm offensive, wrote an op-ed piece for the New York Times, entitled, "Trump Is Right on Syria. Turkey Can Get the Job Done." 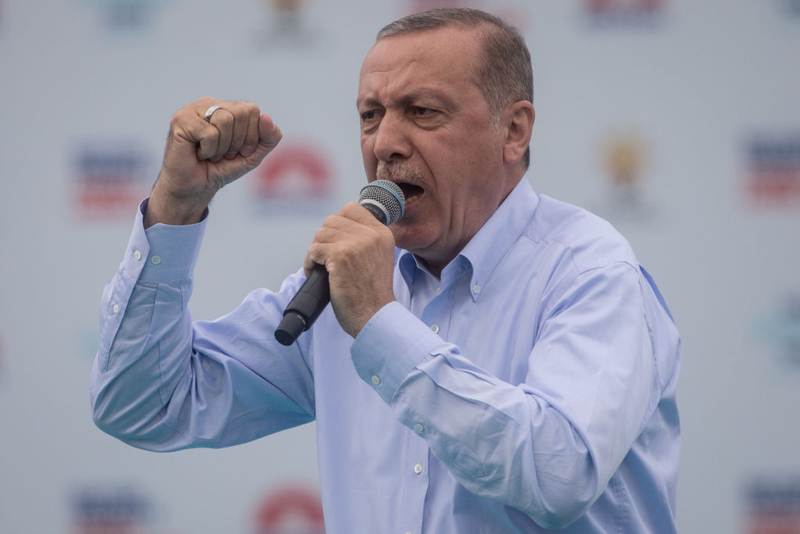 Turkey, Erdoğan claims, is the only country with the power and commitment to perform that task of protecting the interests of the United States, the international community and the Syrian people. This claim is grossly wrong. Despite some convergences, Turkey's interests in the Syrian theater are widely different than those of the Western bloc of countries. Turkey's ambitions over the future of Syria are largely sectarian (pro-Sunni) and, therefore, a good recipe for further violence in civil war-torn Syria and the potential slaughter of the Kurds, a job Turkey can get done. It is true, as Erdoğan reminded the world, that in 2016 Turkey became the first country to deploy ground combat troops to fight the so-called Islamic State (ISIS) in Syria: "Our military incursion severed the group's access to NATO's borders and impeded their ability to carry out terror attacks in Turkey and Europe." Erdogan then claims that Turkish troops and fighters of the Free Syrian Army, which Turkey staunchly backs, "went door to door to root out insurgents in Al Bab, a former stronghold of the so-called Islamic State." Erdoğan, however, fails to mention his ties with Syria's jihadists before 2016. In May 2015, the secular daily newspaper Cumhuriyet published on its front page a video and photographic evidence of arms deliveries by the Turkish intelligence services to Islamist groups in Syria. Erdoğan wrote in the Times op-ed piece: "Turkey is committed to defeating the so-called Islamic State and other terrorist groups in Syria, because the Turkish people are all too familiar with the threat of violent extremism." It is no secret that Erdoğan comes from the top ranks of militant political Islam in Turkey. He categorically and vehemently denies "Islamic terror." He thinks Islamic State is the product of a project that aims to taint Islam. In February 2017, he slammed German Chancellor Angela Merkel's phrase "Islamist terror," and angrily -- and inaccurately -- said to his guest, "Islam means 'peace,' it can't come with 'terror'" Erdoğan himself explicitly said that "there is no moderate Islam." Erdoğan's claim that the "Turkish people are all too familiar with the threat of violent extremism" needs caution. In August 2014, the Turkish polling company MetroPOLL found that 11.3% of Turks did not view Islamic State as a terrorist organization. That is in no way a marginal figure. If a "mere" 11.3% of Turks think so generously of Islamic State, it means there are nearly 9 million Turks sympathetic to jihadists. If only 10% of those decide to support Islamic State's jihad, that comes to nearly 900,000 potential Turkish jihadists. Clearly, Erdoğan's "militarily speaking, the so-called Islamic State has been defeated in Syria. Yet we are deeply concerned that some outside powers may use the organization's remnants as an excuse to meddle in Syria's internal affairs" means "outside powers should not meddle in Syria but Turkey should." Erdoğan suggests that "the first step is to create a stabilization force featuring fighters from all parts of Syrian society." This highlights Erdoğan's desire that his choice of jihadists, the Free Syrian Army (FSA), should control Syria's north, not other jihadists or Kurds. FSA's Supreme Military Council operates with several hardline Islamist groups such as Ahrar al-Sham and Al-Qaeda-linked jihadists. Erdogan accuses Kurdish militants of violating international law by recruiting children. His Islamist allies in the Free Syrian Army have an even darker recent history. In Aleppo, Syria's second biggest city, the FSA implemented a Sharia law enforcement police force that is a replica of the Wahhabi police in Saudi Arabia -- forcing ordinary citizens to abide by the Sharia code. Daniel Wagner, wrote in Huffington Post in 2012 that, "Lebanese newspapers such as Al-Akhbar and Assafir, and Alex Jones' infowars.com, have broadcast a disturbing video of a 12-year-old child apparently forced by the FSA to cut off the head of a Syrian military officer." In Erdoğan's post-U.S. pullout roadmap for northern Syria, "individuals with no links to terrorist groups will be eligible to represent their communities in local governments." This is deeply problematic wording, inviting a serious question: "who will decide which groups are terrorist and which are not?" Basically, by promoting groups such as the FSA, Erdoğan aims to control northern Syria by way of proxy. Erdoğan's plan is merely about substituting jihadists hostile to him with ones friendly to him.